The Blitzkrieg Within: Perhaps, their key to finding the net! Perhaps, their key to finding the net! Chelsea have a redundant battalion of world class midfielders; half of whom are battling for a spot in the playing XI, some are just meant to be loaned out and some just for bench warming purposes. However, the ones who end up playing have one thing in common; they're all reaching out to a striker to finish what they create. Torres over the course of his Chelsea career has only looked a paler shadow of his Liverpool-self. He has never really looked confident enough to lead the Blues' attack. Once, one of the most feared strikers of the league has become a laughing stock! Lukaku "The Drogba in the making", showed glimpses of his ability in the pre-season but failed to capitalize on the starts when it mattered the most. The Super Cup debacle wasn't too helpful either. Ba too has been mis-firing. And Mourinho never seemed to have confidence in either of the three! The search for a dependable striker got stuck with Rooney from the beginning of the transfer period. It reached a dead end and looked like the Blues' would have to scrape through with the available resources till January. Yes, Abramovich does not permit signing of players aged over-30. Only Mourinho could make it happen. 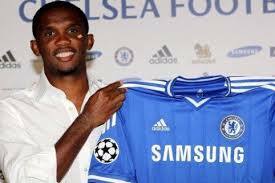 Without splashing much funds, for an year's deal, a player who he has already worked with in the past and won many titles with; Samuel Eto'o was welcomed to the Bridge in a fairly quick deal! He needs no introduction. He had very successful stints at Barcelona and Inter Milan winning back-to-back Continental trebles; making him the only player to achieve this feat with two different teams! He has been declared African Player of the year a record four times! He is definitely no short of recognition for his ability on-field. Eto'o, doesn't lack physical ability. He can break past a defense like a beast with the pace of a bull. Not much known for his delicate shots, he powerfully shoots at will! The pace of football here in England won't startle him! Been a part of Mourinho's Inter, Eto'o is already familiar with his tactics and coaching techiniques; which is probably what made his decision to come here easier. 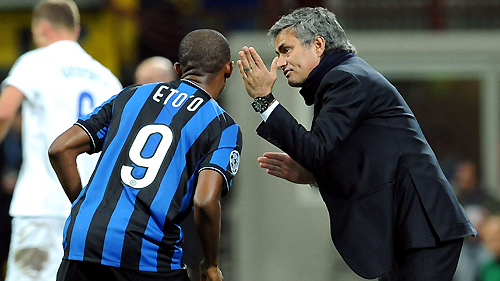 Eto'o would hope for another Champions League title under the Special One once again! The experience card always unfolds while signing any player over 30! Well, in this case the card is very crucial. Having played in the top flight of Spain and Italy, he is no stranger to playing in multiple competitions throughout the calender! His experience comes as a bonus to a side which is practically new school. The only catch that remains; whether he can continue his overseas scoring here and make his way into the XI with three other strikers in the background. He would have to play some really amazing football to impress the Owner into granting him an extension next season! If Eto'o sticks, Torres will definitely be counting his days!